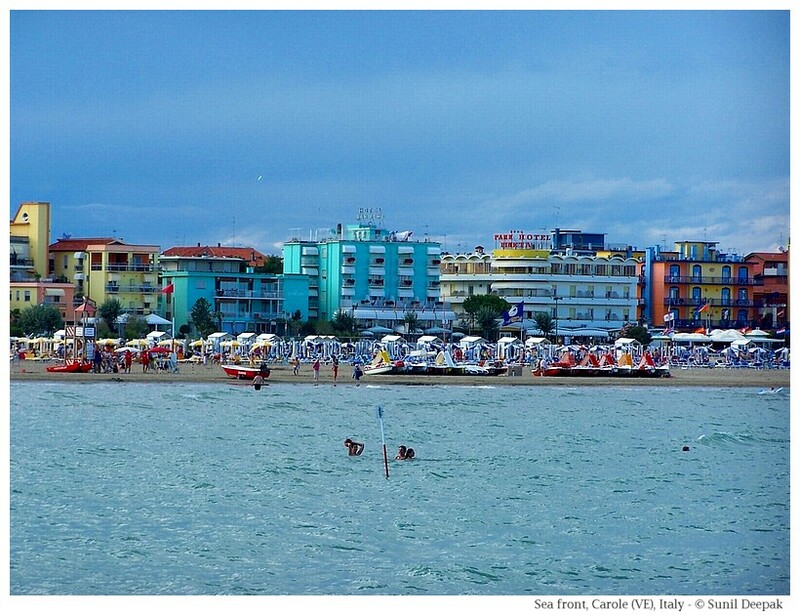 The tiny seaside town of Caorle to the north of Venice is a little gem on the northern Adriatic coast of Italy. It comes alive in summers when tourists arrive here from different parts of Europe. With transparent blue sea, history, culture, art and colours, it seems like one big picture postcard. This part of Italy is dotted with small seaside towns such as Jesolo, Portoguraro, Bibione and Lignano, full of summer tourists. Apart from the seaside holidays, they offer cultural opportunities in the neighbouring cities. 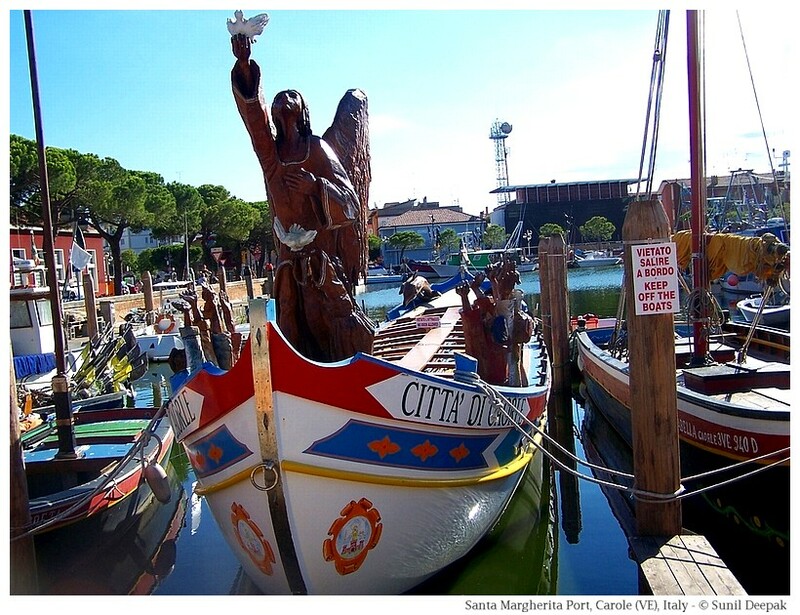 Caorle is one of my favourite places for a day visit during our summer holidays in Bibione. Caorle is an ancient town, dating back to pre-Roman period. It's name comes from Caprulae (pasture land for goats). Others believe that its name comes from Capris, a Pagan goddess. In the past it was a part of the Republic of Venice. Residents of Caorle are only 12 thousand, and most of them live in the old medieval part of the town. The houses are painted in bright and give a distinct look to its narrow winding pebbled streets. The image below shows an old house in Caorle. 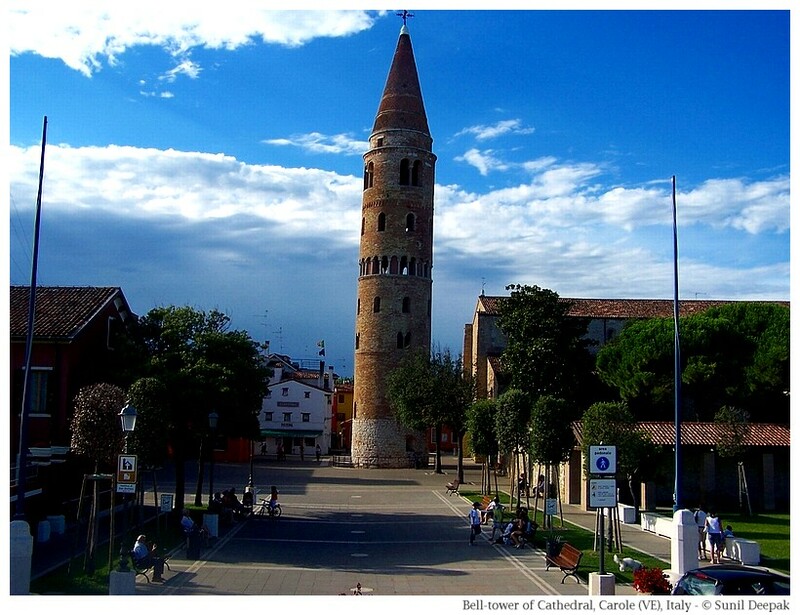 The most fascinating building of Caorle is its thousand years old Cathedral with a beautiful round-shaped bell tower. The Cathedral built in Romanesque style also has a number of frescoes, beautiful paintings (including "The Last Supper" by Gregorio Lazzarini) and archaeological materials (including an old Pagan altar - Ara Licovia). In the image below you can see the bell-tower of the Cathedral. 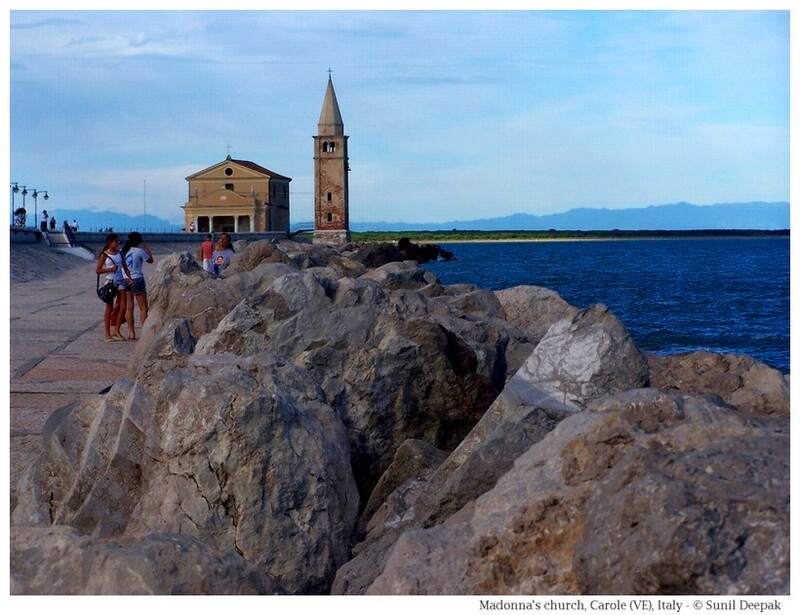 A well known landmark of Caorle is the "Madonna of the Angel church" (in the image below) situated at the edge of the sea. It was rebuilt in the seventeenth century. The local people believe that Madonna of this church has saved their city from many floods and natural disasters. In times of difficulty, local people go there to ask for Madonna's help. Thus, if you want to ask a favour from the Madonna of Caorle, remember to light a candle in this church. 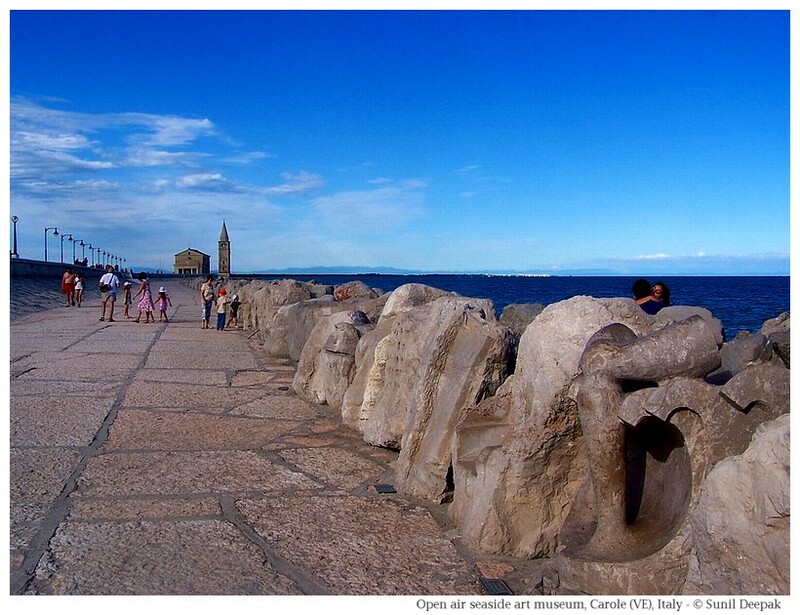 A paved walkway called "Lungomare del ponente" starts from the Madonna of the Angel church. It is protected from the sea by a row of boulders. It is a very romantic place for talking long walks. It is also an open-air Art Gallery: a lot of the boulders along the sea have been carved into sculptures by famous artists from Italy and abroad. Every year the city invites some sculptors to come to Caorle to sculpt a new art work on one of the boulders of the walkway. Thus, if you are lucky, you can see those artists at work (in the image below an artist in 2016). 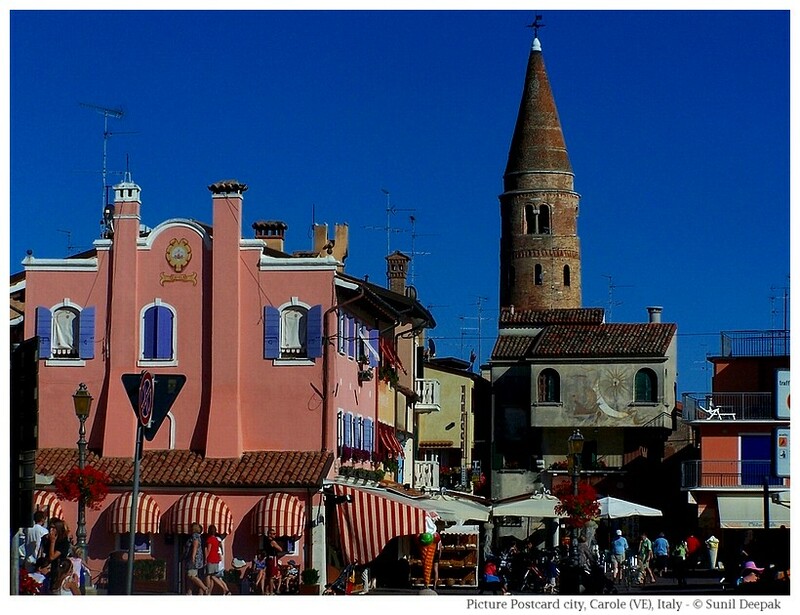 A distinctive feature of Caorle is the colours of its houses. This gives it a bright and fun appearance. The new part of Caorle, along the sea beach has a row of colourful hotels along with shops, bars and restaurants, and a wide beach of fine white sands, that seems to go on forever. I hope that you have liked this short visit to Caorle. I love this colourful little city and look forward to returning there. lovely pictures. So life like. the buildings in old town have their own charm too! So beautiful place. Loved the post and pics. Amazing.